Yesterday I ate an entire avocado. For me, that’s pretty normal — hell, there are days when I eat two avocados. And I felt fantastic! But apparently, some people are afraid of eating the whole avocado. The calories! The fat! The HORROR! Well, did you know an entire avocado only has 250 calories? Plus almost 20 nutrients including some of my favorites — mono- and polyunsaturated fats! Think about a serving of peanut butter. 180-200 calories for two measly tablespoons (the size of a golf ball!). Hmm…an ENTIRE avocado for 250 calories or 2 tablespoons of PB for 200 calories? I’ll take the whole avocado, please (though that’s not to say I don’t like PB…I happen to be a PB fanatic). Okay, so how did I manage to eat an entire avocado yesterday? Well it’s quite easy and it made my meals and snacks all-the-more satisfying. Had about 1/4 of an avocado with my kale omelet, had the other 1/4 on my seared tuna sandwich at dinner. And the other half? 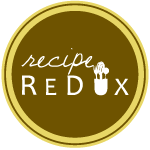 I made a super-easy, super-delicious savory Greek yogurt snack! 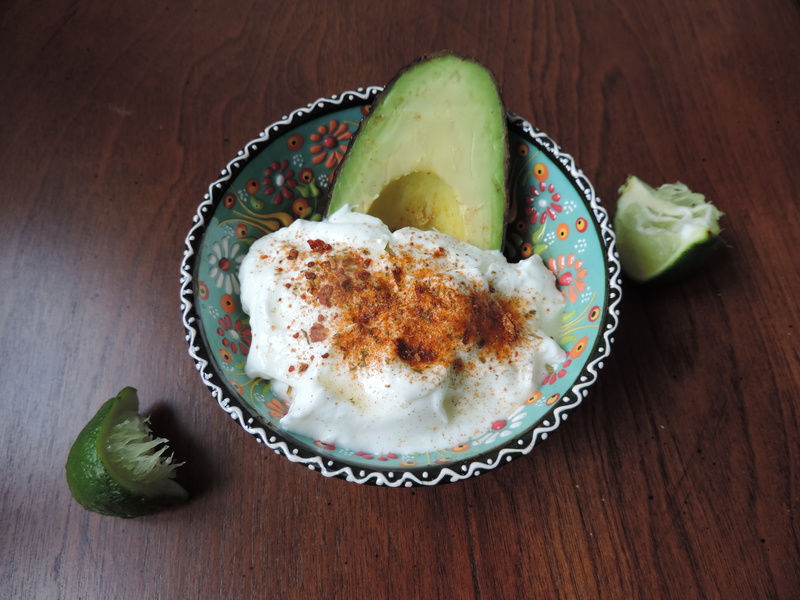 Enjoy this recipe as a deliciously creamy, satisfying snack. I used a chili/paprika/citrus spice blend, but salt-free taco seasoning would work beautifully. Or just use straight up chili powder. You really can’t go wrong! 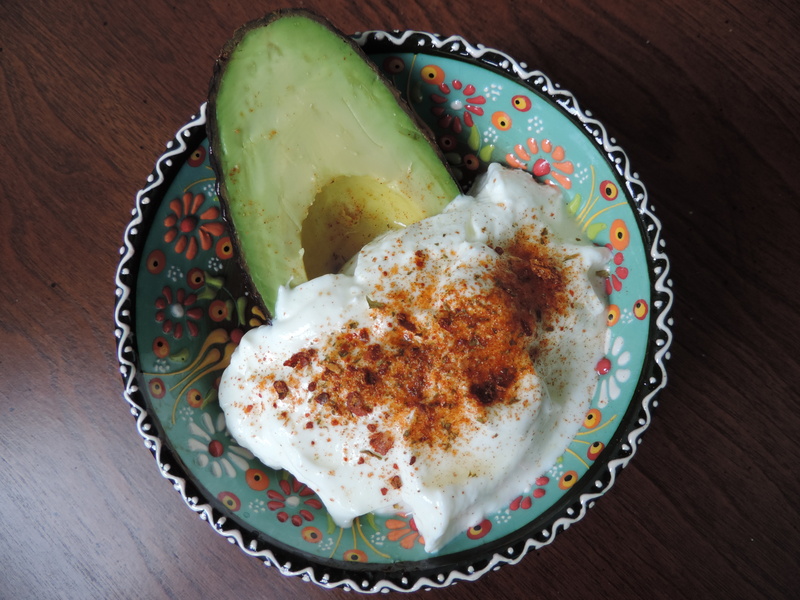 Mix yogurt, lime juice and chili powder in a small bowl. Add 1/2 avocado to bowl and sprinkle with a pinch of sea salt. This would also be delicious with curry powder instead of chili powder! Thanks, Francesca! It’s a great, quick snack. And you can never go wrong with avocados!